Two dimensional (2D) solid-state 13C...13C dipolar recoupling experiments are performed on a series of model compounds and on the visual pigment rhodopsin to establish the most effective method for long range distance measurements in reconstituted membrane proteins. 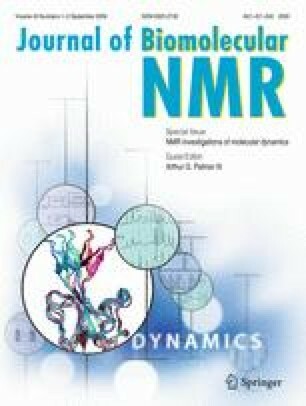 The effects of uniform labeling, inhomogeneous B1 fields, relaxation and dipolar truncation on cross peak intensity are investigated through NMR measurements of simple amino acid and peptide model compounds. We first show that dipolar assisted rotational resonance (DARR) is more effective than RFDR in recoupling long-range dipolar interactions in these model systems. We then use DARR to establish 13C-13C correlations in rhodopsin. In rhodopsin containing 4′-13C-Tyr and 8,19-13C retinal, we observe two distinct tyrosine-to-retinal correlations in the DARR spectrum. The most intense cross peak arises from a correlation between Tyr268 and the retinal 19-13CH3, which are 4.8 Å apart in the rhodopsin crystal structure. A second cross peak arises from a correlation between Tyr191 and the retinal 19-13CH3, which are 5.5 Å apart in the crystal structure. These data demonstrate that long range 13C. . .13C correlations can be obtained in non-crystalline integral membrane proteins reconstituted into lipid membranes containing less than 150 nmoles of protein. In rhodopsin containing 2-13C Gly121 and U-13C Trp265, we do not observe a Trp-Gly cross peak in the DARR spectrum despite their close proximity (3.6 Å) in the crystal structure. Based on model compounds, the absence of a 13C. . .13C cross peak is due to loss of intensity in the diagonal Trp resonances rather than to dipolar truncation. 3.Biochemistry and Cell Biology, Center for Structural Biology, SUNY at Stony BrookStony BrookU.S.A. 5.Department of BiologyMassachusetts Institute of TechnologyCambridgeU.S.A.